Last night, ESO's Wendelstein laser guide star unit had its first light at the Allgäu Public Observatory in Ottobeuren, Germany. Laser guide stars are artificial stars created high up in the Earth's atmosphere using a laser beam with a power of several watts. 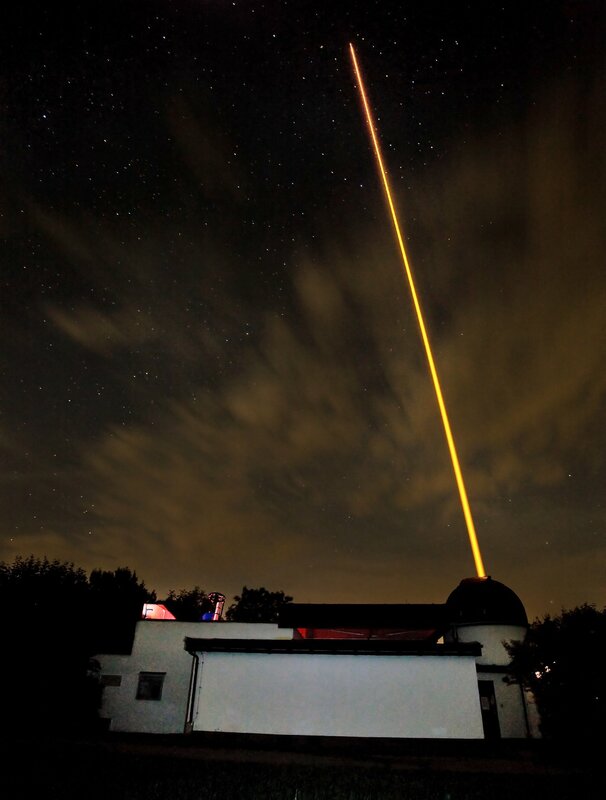 The laser, in this case a powerful 20 watt yellow beam (operating at 589 nm), makes the sodium atoms in a layer 90 kilometres up in the atmosphere glow and so creates an artificial star in the sky that can be observed by a telescope. The adaptive optics equipment can then use measurements of the artificial star to correct for the blurring effect of the atmosphere in the observations. Here the dome of the launch telescope is seen together with the propagating laser beam (right) and the Allgäu Public Observatory's 0.6-metre telescope (left).